A Pantry Challenge can save you money, but did you know that it can save you money, time, and worries longterm? 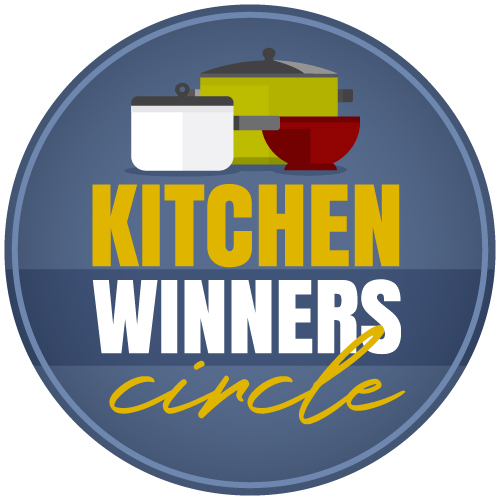 Last month’s Pantry Challenge was a revelation in so many ways. Not only did we save money — our family saved over 50% of our monthly budget — but I think we all (you and me) learned a lot. Certainly eating down the pantry saves you money during the month you’re in. But, there are some long-term savings that you reap. It’s been a true honor to be able to do this with you the last few years. I know that sounds weird, doesn’t it? It’s just groceries and what’s in the cupboard. But, the camaraderie that shows itself during the PC and the encouragement that you all show me and to each other is really humbling. You have once again risen to the challenge and done so well! I love the bits of introspection and learning that come through using what we have. January has been a month of savings for us! Thanks to the pantry challenge and our focus this month on not spending, we added $3000 to our BHAG account! Like a lot of other posters, I am finding that I am using up more leftovers and incorporating odds/ends into my meals. I am still shopping mostly like usual but more conscious of what we already have so that I can use that up first. We learn to shop better. The PC also helped me realize that there are items that I don’t need to buy in the future such as several different rice varieties and specialty flours and grains, we just don’t need so many choices. The PC also showed me that we eat mostly fresh produce and dairy and we add in pantry items like grains to supplement I also don’t keep much meat in the freezer as I don’t have a discount store around and my local supermarket doesn’t offer meat sales very often. This means I can only afford to buy a weekor two worth of meat at a time. Overall the pc was a nice experience for me! I have really enjoyed the pantry challenge this year. It really makes me stop and think before going to the store and makes me very mindful when I’m in the store. Like some others have said, I don’t really stock up my pantry and freezer like I used to. It’s mostly because of doing pantry challenges, and partly because things in the freezer would get freezer burned from being in there so long. We don’t eat meat that often, so I don’t buy meat until we plan to eat it. We also don’t eat a lot of canned food, so I just don’t buy much of that anymore either. I am very happy with the way this PC went for me. I spent at least 50% less than I normally do. One thing I’m not doing is filling up my pantry with so much stuff anymore. It’s good to get things on sale and stock up but not to the point where you have to make a concentrated effort to get rid of it all again at least not for me. I promised after the last pantry challenge that I would not overfill my freezer any more and I haven’t. Now I have to do the same thing with my pantry. I have to keep reminding myself that the store is only five minutes away if I really need something. Also better menu planning helps too and that’s what I need to work on. Have loved reading all the comments during the last 4 weeks. Makes me realise just how lucky we are to be able to do this!!! Can’t thank you enough for the Pantry Challenges, as I tell you every time, and reminding us how lucky we are to have enough to survive and survive well on what we have….Reminding us what we have not what we don’t have! As we were prepping dinner I thought to myself how fortunate (spoiled) we are that we can do a pantry challenge and still have so many options as to what we prepare. Thanks for going on this crazy adventure with me! Would you take a minute and plug in the amount you saved on the challenge for January right here? I’ll let you know the total in a few days once everyone has a chance to sign in. I imagine this is going to be the best challenge yet! What was your biggest take-away from the challenge? The most important thing I took away was the fact that when I stare into the freezer or pantry or fridge and say there’s nothing good to eat in here, I realize that that is completely false. As long as there are edible products in the house, there’s always something to eat. The only thing you need is a little imagination. We all work so hard for our money and have many different places where it needs to go. One of the best places to cut back is on groceries. I can’t believe the amount I saved just by being mindful of what I already have. This type of thinking is one that I will continue to live with. I am a very frugal person, but must remember that just because something is on sale does not mean I need to purchase it. We ate well during pantry challenge with very little life changes. I am glad to have the extra money to add to savings. On another very exciting note, my daughter is in labor and today I will get a new grandson. We’re from Seattle area and it’s Superbowl Sunday. Little guy’s daddy is a football fan (over the top)! So much to be happy about! I realized the same thing about myself. 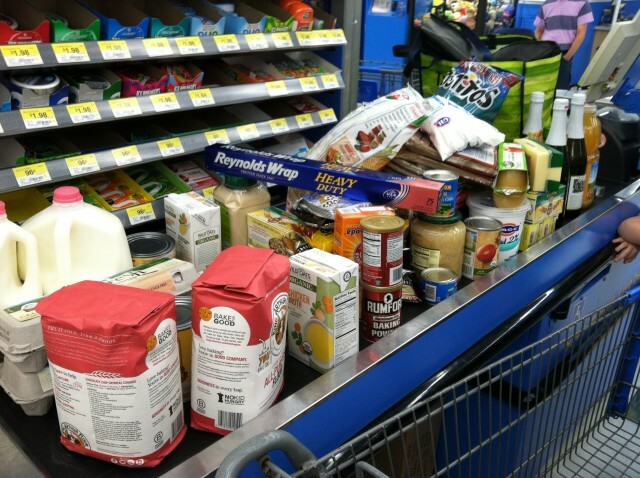 It is extremely difficult to go to the store and ONLY buy what we absolutely MUST have…. I am so tempted to pick up *this or *that because I know we’ll use it… but we don’t NEED it!!! A strict PC helped me stick to my list. I’m part of that club, too! 🙂 Congrats on the new baby! How did everything go? Adorable teensy baby Cormac Elias. Born Superbowl Sunday. All is well. 5 lb 9 oz. Love, love. love. Take-away: I need to have a conversation with our housemate about sharing food. I’m fine with her using condiments here and there, and sometimes we make food to share, but I went to make spaghetti and garlic bread last night and found the following missing from the pantry: 1 jar pasta sauce, the rest of the fake-grated-cheese-in-a-can (when she had a chunk of expensive parmesan in the fridge still! ), the rest of the butter (like 3 half-sticks last time I checked), and 4 packages of gluten-free pasta!! As I texted my wife in a huff: I can’t menu-plan like this! Under normal circumstances I’d get more, or ask the housemate to pick up replacements, but she’s out of town for the weekend and we’re not buying groceries until March. It’s much more noticeable and frustrating under these circumstances. That sounds super frustrating. I hope that you guys were able to resolve it. Like Stephanie M, there’s always something to eat, if you use your imagination. I’m still continuing on with the Challenge. I was looking through some recipe clippings today and found a great soup that, when I adjust it (I do this ALL the time with recipes.. Unless is baking, they’re “guides”), I already have all the ingredients and now have even more meals to go before needing to replenish proteins (except that pesky Costco deal on salmon… Will NOT pass that up). That soup will use up several pantry ingredients that have been languishing! Also learned to challenge myself in the kitchen! I finally tried making the focaccia. I’m always scared of yeast based baking. Don’t know why. It was AWESOME! And will replace some of the constant bread buying. And I reminded myself that if I plan better and survey what we have, I’ll make better use of our food and spend less overall. And we eat really well. Really well. So glad that you’re going to bake now! That opens a world of opportunities to you! -lastly, our family of four can easily stay within my budget of $600 and still eat locally and organic very often! Most importantly, we are very fortunate to have what we have!! I love this. I’m so glad. I think how we “think” about our situation is so important. We aren’t “Without” most of the time, are we? I realized during this pantry challenge that I’ve kind of gotten lazy in the kitchen. I bake my own bread, but I used to make all of our rolls and a lot of our buns too. This time I decided that I wasn’t going to buy buns or any breads (except flour tortillas, which I may try!) and I made them myself. My husband loved the pita bread I made, so that one’s a keeper for sure. I made corn tortillas, which tasted good but need more work. I made my usual recipe of hamburger buns, and everyone loved them. I just have gotten lazy and thought it was easier to buy them, and that they tasted about the same. They really taste better made at home and I do have the time, so I will continue to make these things myself. I saved about $400 during the January pantry challenge, and I’m going to keep going just a bit longer. Great job! I get lazy on the baking, too. I feel ya. I finally made time this evening to tally my January grocery receipts. I know I mentioned early on in the PC that we had our youngest daughter home from college on winter break thru January 19 so I prepared her favorite dishes upon request. Knowing this would be the case going in to the PC, I set a goal of using up the meat in our freezer instead of buying more. I did make a dent in that department and plan to continue with that goal through February. Our grocery bill for the month was $334 (for 3 adults). Once the girl went back to campus, I focused on using what was in our pantry and filled in with fresh fruit and veggies. For the last 11 days of the month, our grocery bill was $74 for the 2 of us (that’s included in the $334 mentioned previously). I’ve had a difficult time making the transition from shopping/cooking for 3 adults to 2. Through the PC I’ve learned that I need to be more diligent in menu planning and sticking to the list when I go to the store. 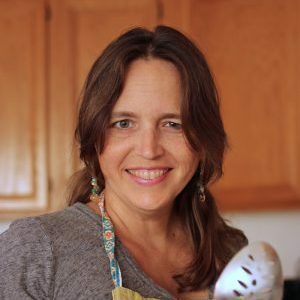 Jessica – thanks for challenging me regularly each year to eat down what we have! Thanks for participating, Nancy. You always add a lot to the conversations! Last year we based our grocery budget on the USDA’s Low Cost food plan, which was $862 per month. We made the decision to base our 2015 grocery budget on the USDA thrifty plan, which is $655 or a reduction of $207 dollars. We saved $100 off our reduced budget so we spent $300 less than December. 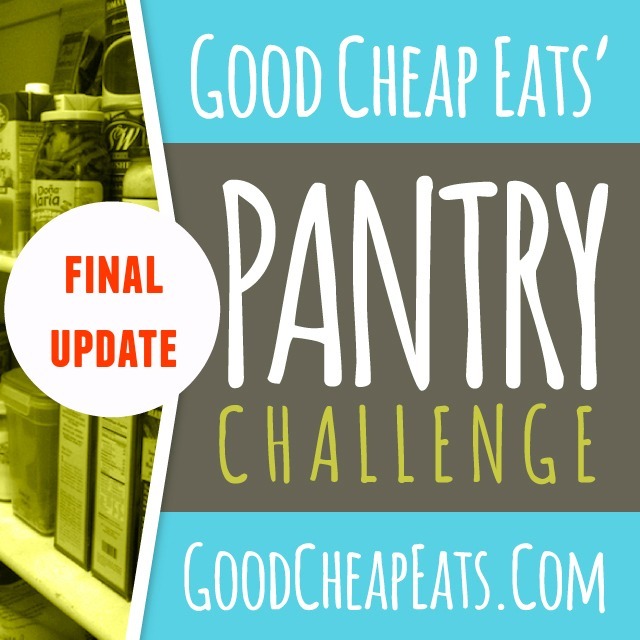 We used the pantry challenge to see if we thought we could stick to a reduced budget. We learned that in order to continue to eat well on our lower budget I will need to bake more, have a few more low-cost dinners per week and be vigilant about using up our leftovers to reduce waste. All in all, I think we can make the thrifty plan work, which would save us nearly $2,500 in 2015. You are always so on top of things, Janet! I need a little bit of that. Great job crunching the numbers and planning a course of action. As many others have said, the PC makes me realize how very fortunate I am. Even when I think my cupboard is bare I have plenty to eat. We are so blessed. My biggest takeaway this year is that my family’s preferences have obviously changed. I’m used to cooking big batches of recipes and freezing. No one is really eating the leftovers. The freezer was stuffed with leftovers no one actually wanted. Hubby came straight out and said he hates the taste of most frozen cooked food. The pantry also had a lot of “favorites” that apparently the kids don’t like anymore so I can stop buying. I’m actually doing a second month (half month?) on the challenge because I want my freezer and pantry empty. I can see lots of space but they aren’t empty yet. Looking forward to next year’s challenge! Thank you for giving me a place to talk about doing this. Interesting on the freezer. Since I wrote a book on freezer cooking, I’m curious. 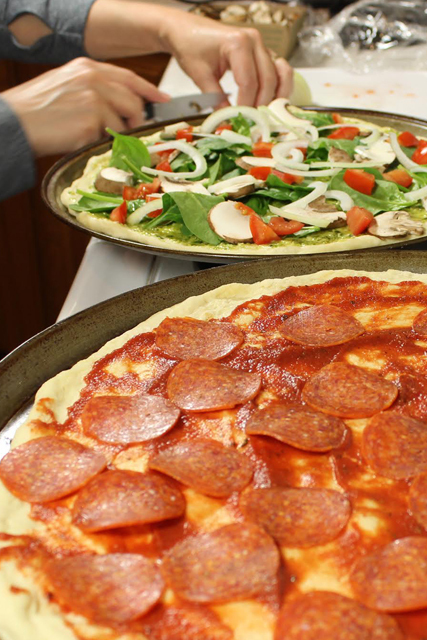 We don’t notice a difference between what’s freshly made and what’s been frozen. At least you know more about their likes, huh? 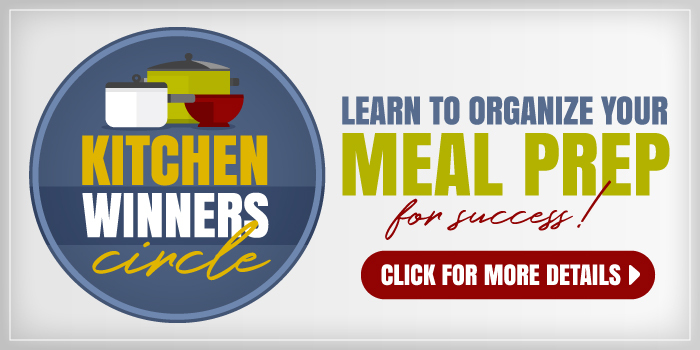 I did not do a full month of the pantry challenge or even a formal one with a pantry and freezer inventory, but we saved $50, or 12.5% of our grocery and household budget of $400 a month for our family of three. With a limited budget I do not have much surplus stored in either my pantry or freezer, but there are always items, especially in odd amounts, that need to be used up in creative ways. As I meal plan each week I am making a conscious effort to use more of what we have, rather than just what I want to/is convenient to make or my family wants to eat. I realized that I haven’t used a chicken a month which is what the plan had been before I started working so that is what I had ordered from the farmer this year. Now that I’m working its a struggle to use those 3lb-5lb cuts of meat (we bought a beef quarter last spring and its still going strong). I did use one of the 2 turkeys from the freezer though last month, and it put 3 meals into the freezer..
Our savings was 150 which is half of our usual grocery budget ($300 per month) for a family of 4 due to the large meat purchases and a lot of gardening. But I still have way more food in jars that we have hardly touched so my next goal is to eat more out of the jars so I have empty ones (although we would rather vegetables from the freezer). Could I have saved more, sure, I did better last year. Can I continue to eat what we have on hand, yup and I am going to again in March. We can always improve more. You did a great job!